MTR: Travel to Sheung Wan on the Island Line. Take Exit A1, and turn left after you exit. 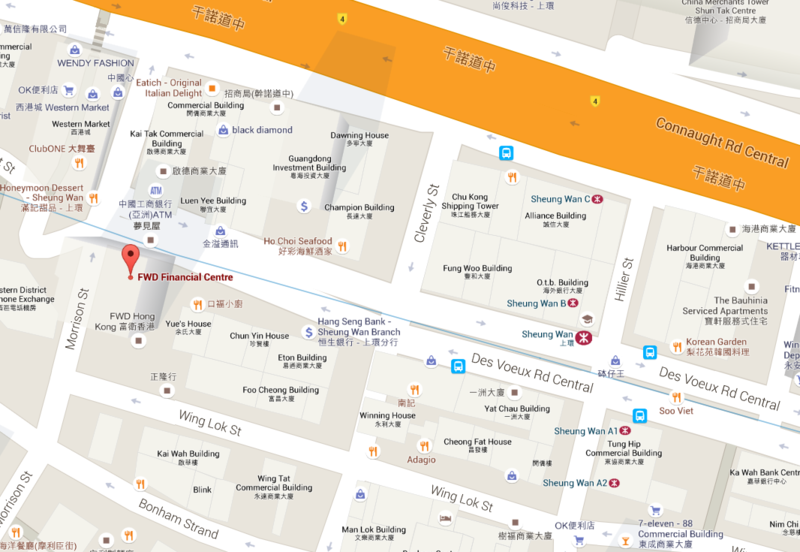 Walk straight for two blocks to find our office at FWD Financial Centre on your left. Alternatively, you may take Exit A2, and turn right after you exit to find our rear entrance just before the intersection of Wing Lok Street and Morrison Street. Tram: Tram station “Western Market” is located directly in front of FWD Financial Centre. Please visit www.hktramways.com for schedules, travel times, and additional information. Bus: Please visit http://www.nwstbus.com.hk or www.kmb.hk for schedules, travel times, and additional information.